In the Rainbow Equation time axis there are representations of time on the third dimensional level as well. Directly across from the Time Symmetry Co-Incidence diagram are the three dimensional models representing time and how the observer relates to it. 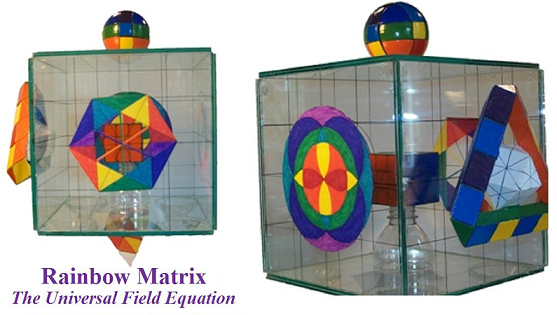 These three dimensional models are representing three different modalities of time – 1. White Symmetry Vector Equilibrium 2. 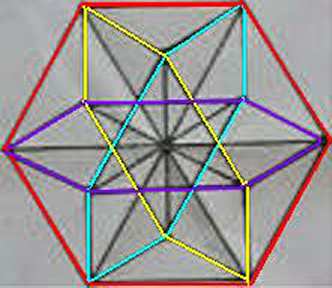 Fourth Frequency Three Dimensional Rainbow Triangle 3. Third Eye Open. Each of the three modalities of time have certain characteristics that help us understand the observer's interaction within the time matrix. As in nearly all other aspects of the Rainbow Equation, we begin at observer's central perspective. In the center of the third dimensional expression of time is the White Symmetry Vector Equilibrium. The White Symmetry Vector Equilibrium is a perfect balance within the matrix of space. The vector equilibrium maintains complete equilibrium with the twelve spatial directions. Standing energetically at observer's center an exact vector relationship is maintained as one connects the center sphere of consciousness to the closest packing of twelve same sized “consciousness” spheres around themselves. There are twelve lines of intentionality that move forth from observer's center into the central point of the twelve surrounding spheres. This central relationship of the thirteen spheres forms the matrix of the vector equilibrium as the vortices from the walls formed between the vertices spiral into the sphere's central axes. All is in balance as the observer moves from central sphere's zero point along the symmetry of lines of intention in the 12 directions of space. The white of the White Symmetry Vector Equilibrium represents Pure Consciousness. We observe light as white before it diffracts into the visible color spectrum. Light and consciousness are one and the same. In actuality light is invisible or clear. It only takes on the color perceived as white as it begins to move into the experiential field of time. Pure consciousness and pure light are invisible. They are all encompassing and omnipotent in the same manner as space. At the very center of the axis of time is pure light and pure consciousness. It is in perfect balance and equilibrium with the space matrix that surrounds it. The White Symmetry Vector Equilibrium shows this perfect balance within the matrix of space. Within the matrix of the White Symmetry Vector Equilibrium lies all potentiality to manifest perfectly within the experience of time. Representationally, every point in space and the White Symmetry Vector Equilibrium are synonymous terms. Every point in space awaits in perfect balance and potential to manifest as intention moves upon it. When perfect intention and perfect balance move upon any point in space the perfect manifestation will occur in the experience of time. The White Symmetry Vector Equilibrium is a template to remind the observer the purest of consciousness will manifest perfectly within the all encompassing matrix of space and within the field of time. The White Symmetry Vector Equilibrium is a template to remind the observer the purest of consciousness will manifest perfectly within the all encompassing matrix of space and within the field of time. When one becomes the perfect central sphere of influence they manifest perfectly along the outer spheres of influence forming greater and greater equilibrium and potency to bring about their heart's desire within the experiential field of time. Within space there is no time. When intention acts upon space then there is movement. It is this movement that creates time and the experience of time. In space there is pure consciousness. The purer the consciousness and intention that is set forth, the purer and more expedient the reflection will be. Pure thought, word or deed streams forth into the universe of infinite potential and manifests quickly. This is where the third part of the description of the process of time manifesting into the third dimension comes into play. 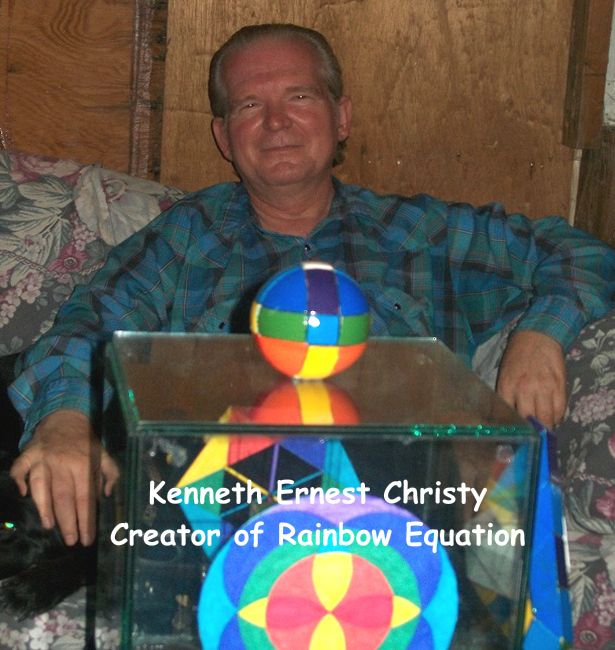 The third part representing the Rainbow Equation's three dimensional polarity of the axis of time is referred to as “Third Eye Open.” The Third Eye Open is a combination and inter-blending of the White Symmetry Vector Equilibrium and the 4F 3D Rainbow Triangle. Here, as the two descriptions blend together, the process of creation has taken the steps necessary for its manifestation into the field of time. The Third Eye Open is a reference to the sixth energetic chakra located at the brow point between the eyes. This connection to the third eye “Open” implies the total connection between the unbounded sphere of space and the spectrum of the planes of experience has been made. “We create our own reality.” It is our focus upon the creative cycle that starts the movement toward creation. The creation is represented on its simplest level as the 4F 3D Rainbow Triangle showing the first signs of manifestation. Within our center of perception lies the ability to coalesce matter from the unbounded nature of space itself. The center of perception is at our third eye center. To reach perfect communion between the being of space and to reflect that perfectly into the planes of experience is to have the third eye completely open. To reach perfect communion between the being of space and to reflect that perfectly into the planes of experience is to have the third eye completely open. The area of the third eye is an energy center referred to as a chakra center. In the same way the second through the fifth chakras spin as dual vortices horizontally into center so does the third eye. This means that the third eye chakra not only spins inwardly from a position in front of the brow point it also spins inwardly from a point in the back of the head located directly across from the forward vortex. The point of the two vortices' connection is at the Pineal Gland. The pineal gland is located in the approximate geometric mass of the brain's center yet technically is not considered part of the brain. Except for the kidneys, the pineal gland receives more blood flow to it than any other part of the body. This mysterious gland, which is about the size of a pea, gets its name for it shape, which is in the form of a pinecone. The word pineal is from the Latin word pinea, which means pinecone. It is at our third eye center, the pineal gland, that communications of thought and psychic transmissions are received. It is also here that we “see.” The pineal gland is our connection between our mind and the mind of the universe. When we dream, think thoughts, see images or hear sound it is this center that connects us to the greater mind. In reality “The Mind” is all one mind. All is in communication with all other points in space at the same time. The individuation occurs at our center of perception. The third eye center acts as a type of microprocessor relaying all information from our experiential field into our mind where it can be translated and acted upon. All information is in a state of vibration and can be picked up through the field of transmission. We are both receivers and transmitters. The third eye is our connection between inner and outer worlds. In the time axis of the Rainbow Equation it is the representation of pure and complete connection with the field of time/space and the experiential field. When one connects with pure intent and love they are in accord with the divine and one with universal source consciousness. They become one with the unification process and quantum reality. A fully activated pineal gland can shift the dimensional world around the observer as the matrix of space aligns multi-dimensionally. This is the connection to healing, synchronicities, materialization, dematerialization, time travel, levitation and a whole host of phenomena that happen as one interacts with the subtle fields of universality. It is in the pineal, the etheric body and physical body touch each other at a single point. It is at this point we connect our mind to the universal mind. Blending these two, which in reality are only one, can open the door to omnipotent power. The time axis of the Rainbow Equation is representative of movement within this one mind. We have the power to connect within time and beyond time. The portal of time represented here is a combination of all as described within the time axis of the Rainbow Equation. It is a blending of the two dimensional reality of Time Symmetry Co-Incidence with the other higher dimensions. Within the co-incidence of time we move from zero point of no dimension. It is this very movement that creates time and experience. We connect our mind through the lines of intention within the first dimension and align with the Merkabah and the symmetry of the space axis with the vector equilibrium – Creation begins and continues. We witness this creation as planes of experience within the second dimension and the movement of time. Herein, the experience of time is realized as space becomes light, light becomes particles and particles organize into expression within the third dimension. 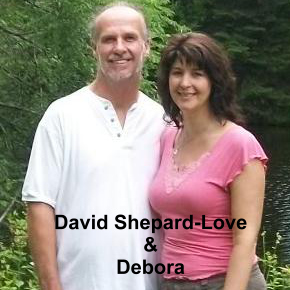 We have created time from our center moving into zero dimension and manifesting in our 3D world. 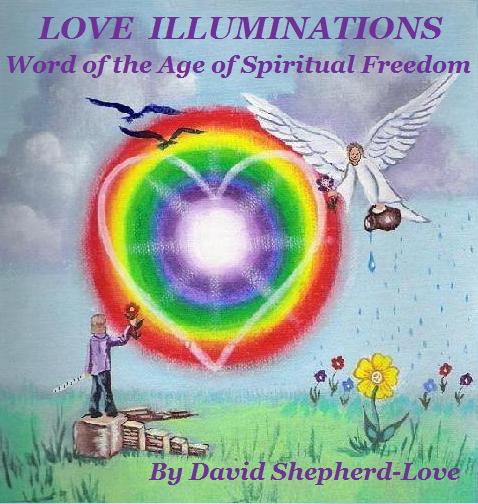 Making available the most comprehensive information ever about the RAINBOW in the areas of Spirituality, Good Works, Science, Philosophy, Visions-Dreams-Signs & Wonders and Wisdom to Aid Humankind and Our World. 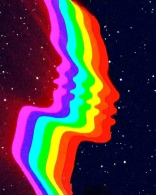 To Help Facilitate a Process that Allows the Rainbow's Naturally Occurring Geometric Energy Field to Harmonize Self into Ever Expanding Areas of Awareness In Harmony with Universal Law.